GRANADA, Spain (February 6, 2018) — You now have one less excuse not to plan a bike trip to southern Spain now that the Biking Sierra Nevada route map is available for download. The new map serves up 1,164 kilometers (723 miles) of routes dedicated to off-road riders and located throughout the Sierra Nevada Park system, which is 4.5 hours south of Madrid in the province of Granada. 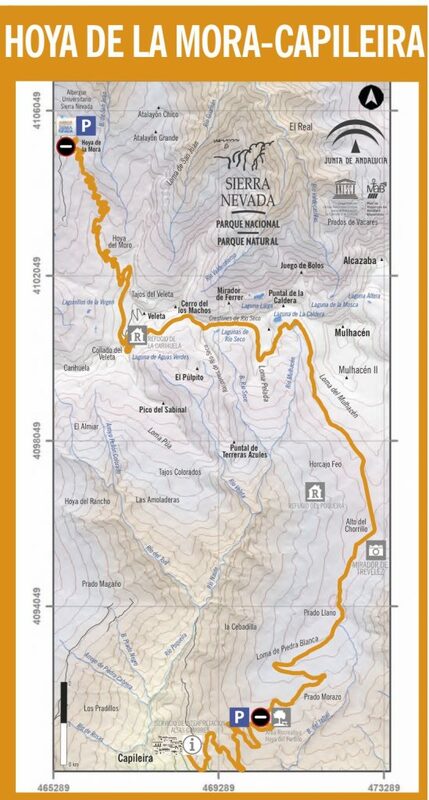 The map also introduces in both English and Spanish, Europe’s highest cyclable climb, and the multi-day Transnevada, which circumnavigates the entire Sierra Nevada range. Last year about this time Granada’s tourism department introduced a similar map for road cycling around the province, which borders the Mediterranean Sea and boasts the two highest peaks on the Iberian Peninsula. This year’s map for mountain bikers and gravel riders was produced in collaboration with the Sierra Nevada Parque Nacional and Parque Natural and highlights six riding zones dotted around the 1,723 km2 (665 square miles) Sierra Nevada region. The map’s two most brag-worthy routes are the 8-stage, 450 km (280 mile) Transnevada, which circles the entire Sierra Nevada range, and the Hoya de la Mora to Capileira via Europe’s highest cyclable climb. Veleta is a regular entry on lists of superlative bike climbs like “world’s highest/toughest/hardest” and, at 3,394 m (11,135 ft.), Veleta more than deserves the distinctions. Three dedicated ride centers warrant significant ink given that one is usually enough to cause a stir. The Sierra Nevada Bike Park features lift-assisted downhill trails while the Centro BTT Güéjar Sierra offers both cross-country and enduro routes. The Centro BTT Nevada is the farthest outpost at 103 km (64 miles) away from the city of Granada but it has the most to offer, which simply means 337 kilometers (209 miles) of trails and a cumulative elevation gain of 9,790 meters (32,119 ft.). 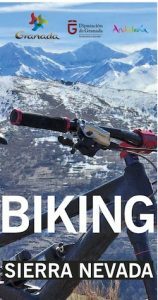 The new Biking Sierra Nevada map is available for download here. Hardcopies of both maps are also available at the Patronato Provincial de Turismo de Granada in the city’s center at 3 Calle Cárcel Baja.